There are few things in the world as beautiful as an orchid bloom, so why not bring them into your home? Here's your guide to growing indoor orchids. You may have heard horror stories about growing indoor orchids. Believe me, I’ve heard them all myself! If you talk to virtually anyone who’s unsuccessfully tried to grow orchids indoors, you probablyheard how fickle they are. And it’s true. Orchids aren’t like any other plants. Not only are they one of the most stunning flowers out there, they also thrive in very specific growing conditions. This means that throwing your orchid plant into a pot of soil, placing it in a windowsill, and hoping for the best is honestly not going to cut it. Orchids take a bit of work, but they're worth it! They can add the missing element to your home decor. Here’s some information about how to care for your orchids. Even though orchids are one of the most common and arguably most beautiful indoor plants, they have very specific sunlight needs. For starters, avoid placing your orchids in direct sunlight. Instead, find a place with good indirect sunlight such as behind a sheer curtain. Then, ensure the plant gets at least 6 hours of light every day. Plants getting the right amount of sunlight have characteristically thick, green leaves. Brown leaves indicate inadequate sunlight and yellow leaves mean you need to move the plant away from direct light. How much water do orchids need? You may be surprised to learn that orchids aren’t watered as frequently as other houseplants. 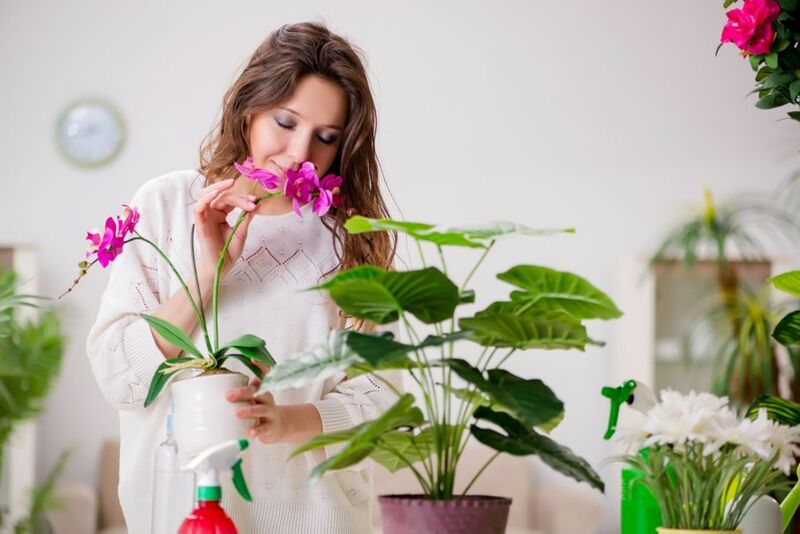 Because an orchid’s thick roots are made to absorb and retain a significant amount of water, you just have to give your plant a thorough watering once a week. If you notice rotting or brown roots, trim them to remove the decaying parts and decrease watering frequency to between two and three times a month. Another way to ensure your plant gets adequate water without overwatering is to use ice cubes instead of water. Surround your plant with a handful of cubes once a week and you should be all set! Orchids don’t grow in traditional soil. Since the roots absorb all the water the plant needs, you don’t need moisture-retaining soil or peat moss. Instead, place your orchid in a pot of small rocks or bark to allow the roots to easily collect the water. Orchids are naturally found in warm, humid regions. 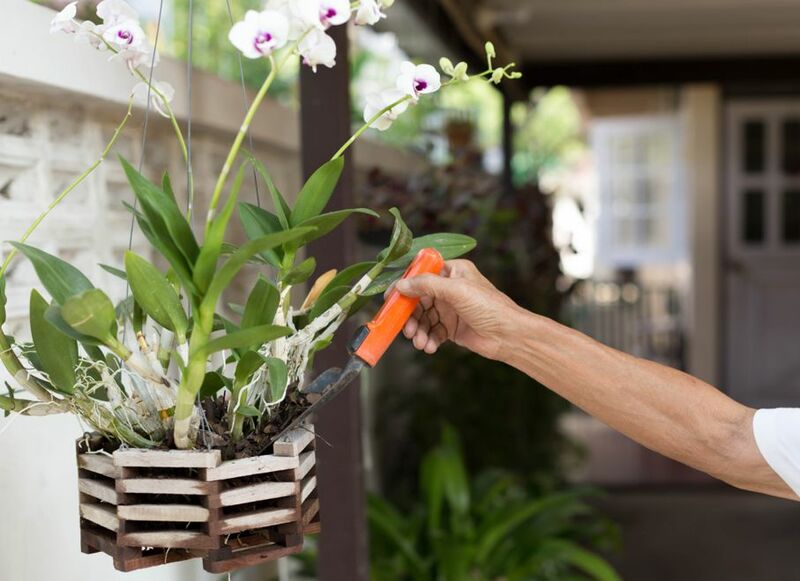 To guarantee flowers year after year, your orchid plant must experience a mild drop in temperature every night, just like it would get if it grew outside in a tropical environment. 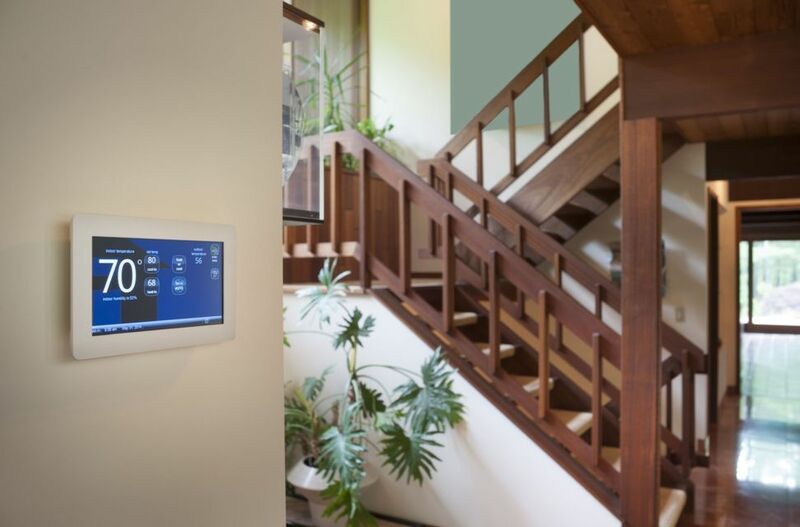 Aim for a daytime temperature between 70-80℉ and a drop to between 60-65℉ at night. While temperature is important, humidity is more so. In fact, a humidity level of between 50-80% is perfect for your orchids. Of course, this isn’t always possible to maintain, so if you live in a particularly dry area, use a humidifier. As you can see, orchid plant care isn’t for the faint of heart. But it’s also not impossible. To truly make the most of your orchids, you want flowers, and the easiest way to get these is by fertilizing. Fertilize each of your orchids weekly with an orchid food mix, which usually has a 20-20-20 ratio of nitrogen, phosphorus, and potassium. When repotting orchids, wait until new roots are growing from the base of the leaves in the early to mid-spring. Be careful as you remove the plant from its current pot and remember that, by this point, many of the roots will be firmly attached to the pot. Slowly and meticulously peel the roots from the pot. Trim away any dried white roots or brown, decaying ones. Then, place the orchid in a new pot with some fresh potting medium and water thoroughly. If you’re looking for interior design ideas that incorporate orchids, focus first on the placement of your orchids and second on the actual pots you place them in. 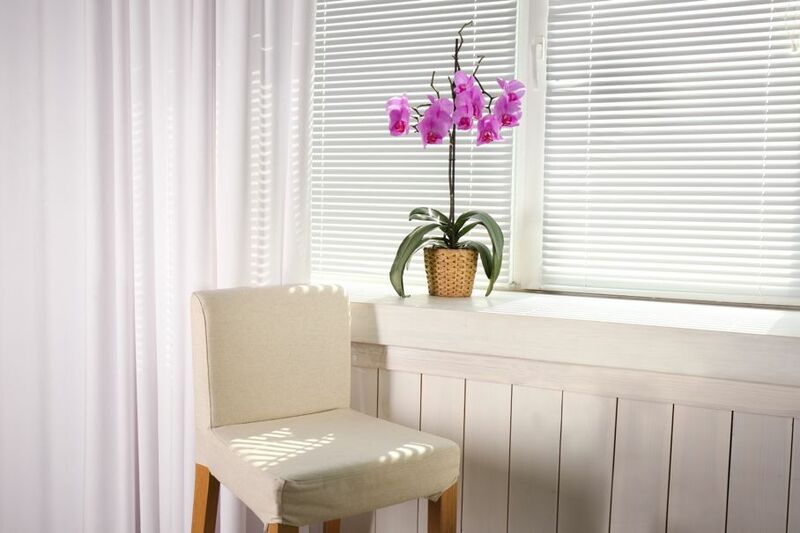 Placing your orchids in bright rooms that are often frequented like the kitchen and living room will allow everyone to enjoy your beautiful plants. To accentuate the beauty of your orchid’s exquisite flower, find pots made of clay or ceramic that match your home’s decor. There are few things in the world as beautiful as an orchid bloom. Yes, they take some work and specific growing conditions, but the results are out of this world and one of our favorite interior design ideas here at House Tipster.